T he Barrington area has long been known as a great place to raise a family, own a business, enjoy rich cultural assets, explore the outdoors and still be within a stone’s throw of Chicago. Spanning across southwest Lake County and northwest Cook County, the area covers nearly 90 square miles. Most often, the spotlight in this area falls on the village of Barrington, but step back and you’ll see that greater Barrington actually encompasses seven independent villages and two townships: Barrington, Barrington Hills, Lake Barrington, North Barrington, Port Barrington, South Barrington and Tower Lakes, plus Barrington Township and Cuba Township, which cover the open spaces between villages. Sometimes those “other” Barringtons get lost in the shuffle, says David Nelson, a former Barrington mayor who has been supervisor of Cuba Township since 1996. Barrington, understandably, is the hub of the region. It has the largest population, at more than 10,000 residents, has the most dynamic downtown and provides services shared by some of the smaller villages, like a post office, park district and fire department. Each municipality within the Barrington region has its own unique flavor, from the open, horse-friendly acreage in Barrington Hills to the vintage shopping nook in Lake Barrington to the entertainment and dining opportunities in South Barrington. One of the common threads in the Barrington region is Community Unit School District 220, a “destination district” that covers 72 square miles and draws from 12 villages. It’s one of the main attractions to the area, with its excellent teachers and dedicated school board willing to try innovative programming, says Mary Dale, a Barrington resident whose 12-year-old daughter and two sons, 11 and 8, attend district schools. Even though the district covers a vast geographic space, there’s another similarity that ties the region together. The region has dozens of nonprofit organizations, including the Barrington Junior Women’s Club, of which Dale is president. The 80-year-old club works to improve the lives of women, children and seniors through volunteerism, grants and scholarships offered to high schoolers. Its 200-plus members also provide a good representation of the Barrington area. One of the area’s largest philanthropic causes is the commitment to open space. The fact that three conservation groups – Citizens for Conservation, the Barrington Area Conservation Trust and the Preservation Foundation of the Lake County Forest Preserves – maintain a presence in an area claiming just more than 40,000 people is a pretty good statement that people move to the area for its open land, Nelson says. Wendy Paulson, a naturalist who lives in Barrington Hills with her husband, former U.S. Treasury secretary Henry Paulson, says the couple initially moved to the village because that’s where her husband grew up, and they bought land from his parents. “But we stayed, frankly, because of the conservation ethic that exists in the community,” she says. The area has a long tradition of respect and appreciation for nature, dating back to the 1940s and ‘50s, according to her mother-in-law, Paulson says. Paulson herself was “Nature Lady” for many years at the Barrington elementary schools, and she’s been hosting bird walks in the area since the 1970s. She also has worked with Citizens for Conservation for more than 30 years. From both a business and lifestyle perspective, the Barrington region is a bright spot in Illinois, says Suzanne Corr, president of the Barrington Area Chamber of Commerce. What makes each of these communities so attractive in its own right? Here’s what village officials and locals say. 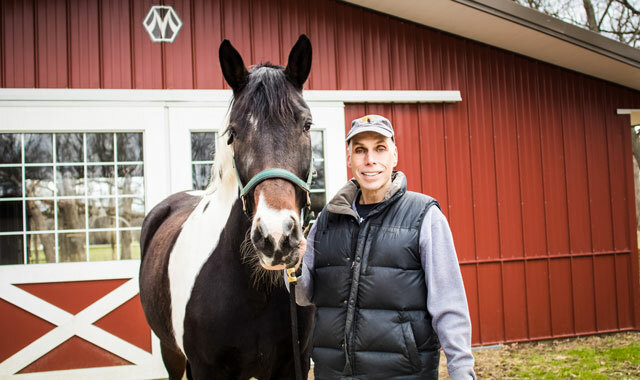 Steve Allen and his wife, Kim Keper, moved from Chicago to Barrington Hills in 1998 for two reasons: the laid-back lifestyle and the equestrian bonuses the village offered. “We had horses in the area, and every time we drove out to visit the horses, we thought, ‘Oh, wow, I’d love to live out here some day,’” Allen says. Barrington Hills, an affluent community of about 4,200, features lot sizes with mostly 5-acre minimums, keeping intact its “sophisticated country living” atmosphere, despite its suburban location. The Barrington Hills Park District also played a role in Allen and Keper’s move because it maintains its own riding center. Amidst the prestige in Barrington Hills is Penny Road Pub, a watering hole that provides just the right amount of personality, Nelson says. On Pepper Road in Lake Barrington, nestled among an auto body shop, tool and die shop, and other industrial-type businesses, lies a handful of consignment and vintage shops that have slowly brought a new clientele to the area. “We went from kind of a plain industrial area to a destination shopping area, and it’s been amazing to see this transformation take place with the help of the area’s businesses and the village of Lake Barrington,” says Julia Smith, owner of Julia and Friends. “It’s not your super-glitzy downtown type of place, but we like that it’s not that way. We have overhead doors that we open when the sun is shining. Lake Barrington has long had a handful of restaurants to attract visitors and satisfy its 5,000 residents, including the Onion Pub, Kelsey Road House and ZaZa’s, plus newcomers Horse Shoe Grill and Pepper Park Coffee. The village also is home to Canlan Sportsplex, a 175,000-square-foot indoor multisport and fitness facility that draws athletes from the entire Chicago area. Perhaps surprisingly, it’s the vintage shopping that’s boosted the community’s popularity most recently. Pepper Road and Friends, a collaboration between 10 small businesses located on or nearby Pepper Road, has hosted successful shopping events like the annual Spring Market, Pepper Fest and a Holiday Open House, Smith says. Despite its newer business environment, Lake Barrington still has country roots, with residents frequently utilizing Grassy Lake Forest Preserve, the community garden and wetlands boardwalk at Freier Farm Park, and a 1.25-mile recreation trail connection from the village hall to a riverside overlook. Those who enjoy the quiet setting of country club living may prefer the northern part of the region. North Barrington, an affluent community of 3,000 residents, is home to two separate golf communities that help preserve the village’s natural environment. Biltmore Country Club is housed within Biltmore Estates, which was established in the mid-1920s on 800 acres. The private club was created as a “weekend rendezvous” with family-friendly amenities and still boasts the area’s only private beach, located on Honey Lake. In the 1980s, 370 acres were developed into the Wynstone neighborhood, a gated community of 437 luxury homes situated on 1-acre or larger lots, surrounded by a Jack Nicklaus-designed golf course that’s ranked one of the best courses in Illinois by Golf Digest. The prestigious neighborhood is home to the Wynstone Golf Club, a full-service, private club. Both clubs draw people from outside the region, says Kathy Nelander, village administrator. Residents have long enjoyed the natural setting of their village and the Lakewood Forest Preserve. Rebekah Snyder, executive director of the Preservation Foundation of the Lake County Forest Preserves (LCFP) and chief development officer of the LCFP, believes North Barrington feels a sense of ownership of the 2,800-acre preserve, even though it’s technically located in Wauconda. “It’s a small village and there’s a lot of open space, and they’re committed to the environment,” Snyder says. The second-smallest Barrington-area municipality is Port Barrington, where original residences still retain the name of Fox River Valley Gardens – the name of this village before 2003. “I don’t know if the Barrington name helps; I don’t know if that puts us up on a higher scale or not, because when you say Port Barrington, people sometimes automatically assume you go to Barrington schools, and we don’t,” says Village President Shannon Yeaton, noting most of Port Barrington lies within Wauconda Community Unit School District 118. The village’s 1,500 residents enjoy outdoor recreational activities, particularly on the Fox River, whose channels run through many backyards and provide great fishing and ice fishing, Yeaton says. The Fox River fuels the only businesses inside village limits, including an autobody shop, three local restaurants/bars/marinas and Fox River Preserve and Marina, which is run by the Lake County Forest Preserves. The Broken Oar Marina-Bar and Grill, with 7 acres of riverfront property, is a well-known stop for boaters, Yeaton says. But it’s just as popular with motorcycle enthusiasts and locals. Nearby, visitors can also find No Wake Bar and Grill, which opened last year, and Hermann’s Rest-A-While, which is popular with ice fishermen. Fox River Marina brings additional visitors to the village because of the forest preserve’s two large picnic shelters, which serve as locations for wedding receptions, family reunions and other gatherings. It also hosts Fred Fest, an all-day summer music festival that benefits the Preservation Foundation. Those who’ve lived in the area for awhile share a similar yarn about Tower Lakes: watch your speed. It’s local legend that the region’s smallest village counts on the revenue it gathers from speeding tickets handed out by the Tower Lakes Police Department. With just more than 1,300 people inside a 1.1-mile radius, Tower Lakes has no commercial district. The village was developed as a summer home community in the 1920s, and its lack of business is part of its charm – just like the covered walkways that stretch across the village’s ponds, Yeaton says. The familiarity among neighbors makes real estate in Tower Lakes a hot commodity. Last year, South Barrington was named the fourth-best Illinois suburb by niche.com, a website that uses data and user input to rank neighborhoods, colleges and schools. The village maintains the third-lowest municipal taxes in Cook County, a fact Village President Paula McCombie finds amazing. The village is a “destination” for a variety of reasons. It houses The Arboretum Lifestyle Center, an outdoor shopping center filled with more than 70 upscale retail stores, 13 restaurants, iPic Theaters and Pinstripes Bowling/Bocce/Bistro. Visitors also flock to Willow Creek Community Church, which brings up to 20,000 people to the village on the weekends; AMC South Barrington 24 Theaters; and Goebbert’s Farm and Garden Center. Though their community is often considered one of the major retail, restaurant and entertainment hubs of the region, South Barrington residents value their open space just as much as their neighbors, McCombie says. The village has a 35-acre conservancy off Bartlett Road, just north of The Arboretum. The passive, recreational area is full of wildflowers planted by conservancy commissioners, and volunteers are actively working to increase its butterfly population, McCombie says. There’s something refreshing, appealing about the open spaces, the neighborly feel and the vaguely rural ambience that ties together the communities around Barrington. This entry was posted on Tuesday, May 2nd, 2017 at 12:00 pm	and is filed under Features, Top Posts. You can follow any responses to this entry through the RSS 2.0 feed. Both comments and pings are currently closed.